Press releases are a timeless, yet current public relations avenue for communicating news, events, and updates regarding your business or organization to media outlets. These brief, informative writing pieces have managed to weather the test of time, with millions being emailed to newspapers, TV outlets, and radio stations every single day. The media loves press releases. They’re like tiny bundles of news stories dropped on reporter’s laps. Given that the media cycle is in constant need of content, you should be taking advantage of press releases with every opportunity possible. Brevity. Reporters don’t have time to comb through 2-pages of your business announcement. 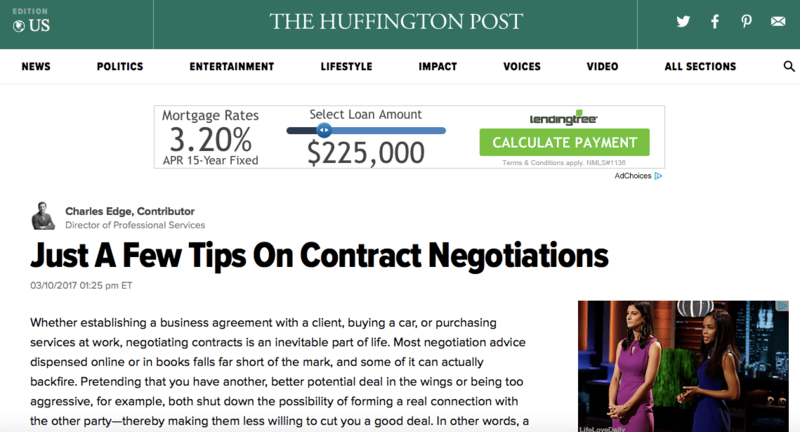 It’s recommended to keep the release between 300 to 500-words, effectively communicating your message without boring the reader. Catchy Title. In order to catch the reader’s interest, you need a one-of-a-kind news-spun title that isn’t also over-the-top. No Sales Language. A press release is about communicating the news. It’s not a time to promote your sales and services in an obvious way. Don’t Try Too Hard. A press release isn’t a creative column submission with the local opinion editor. It’s a news announcement. Treat it as such. Quotes. Including quotes from the business owner or spokesperson is a great way to humanize a press release. Be sure to take advantage of this opportunity, including 1-2 quotes from someone important at your business. Once your release is done, you have two options: you can either email or call it out to local news media personnel, or you can submit it to syndication platforms like PRWeb.com and Newswire.com. The two aren’t mutually exclusive – for a wide variety of coverage, consider doing both, provided there’s value in spending money on doing so. Once upon a time, practically everyone who chatted on the internets used… AOL. Even people that didn’t pay for AOL. Because in a brilliant business move, AOL made their messaging platform free. And it brought a lot of people into instant, online communication. And it was way easier (and prettier) than the predecessors. But it was mostly on computers, not mobile devices. 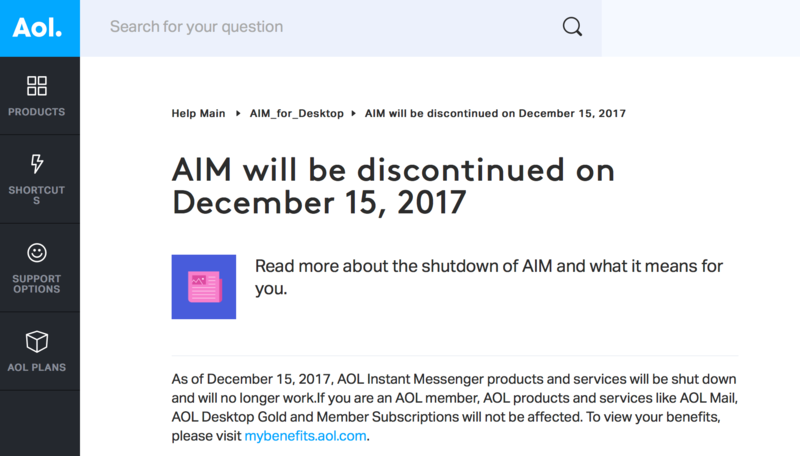 And with constant emoji being added, features being needed, and apps required to make it work on devices, it’s time for AIM to finally be no more. Sunsetting products is never easy. Especially one as legendary as AIM. So why do it? Text messaging, Signal, Kik, WhatsApp, and even Snapchat replaced AIM. That’s an extremely fragmented industry and I don’t think it matches the image of a media company that the post-merger AOL-Yahoo (Oath) wants to be. But it is the end of an era. Actually, it’s being shuttered because that era ended years and years ago. And someone finally decided to let the product go. And I’d say they did so with plenty of notice, and provided copious amounts of documentation on what users can do to retain their data. End-to-end a graceful product end of line, as AIM deserves. Remember Nick Burns, the “company computer guy” played by Jimmy Fallon on “Saturday Night Live”? IT people have long been fixtures in the office (though hopefully seldom as grumpy as Nick). However, their jobs have been radically changed by two trends — the cloud and consumerization. 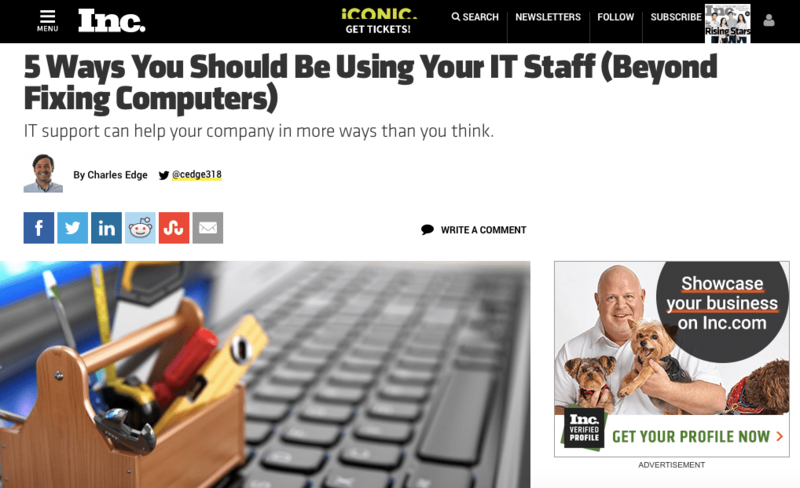 My latest Inc.com piece is about collaborating on documents was just published. 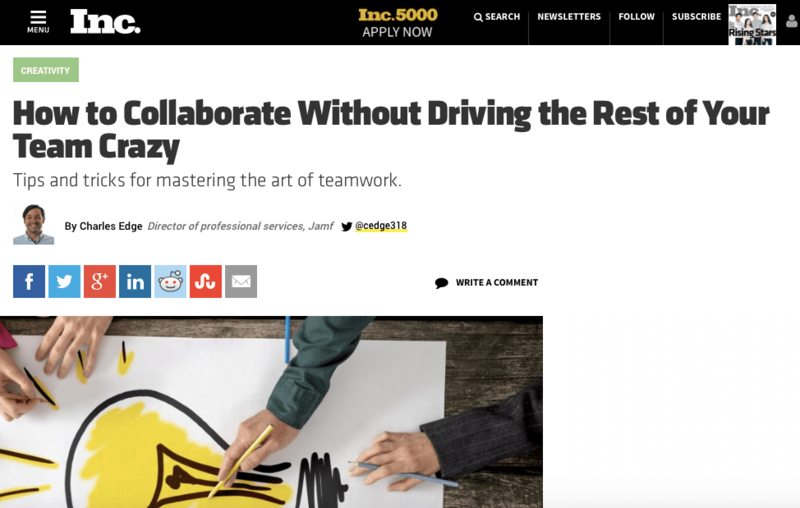 Collaboration is a huge business buzzword these days. And nowhere does that feel more real than when teams work together on written materials. Whether it’s a sales brochure or an internal proposal, teams must work well together to produce high-quality assets. This can be a challenge if the team members work in different locations. Good habits in creating and editing documents can foster collaboration, save time and reduce headaches. 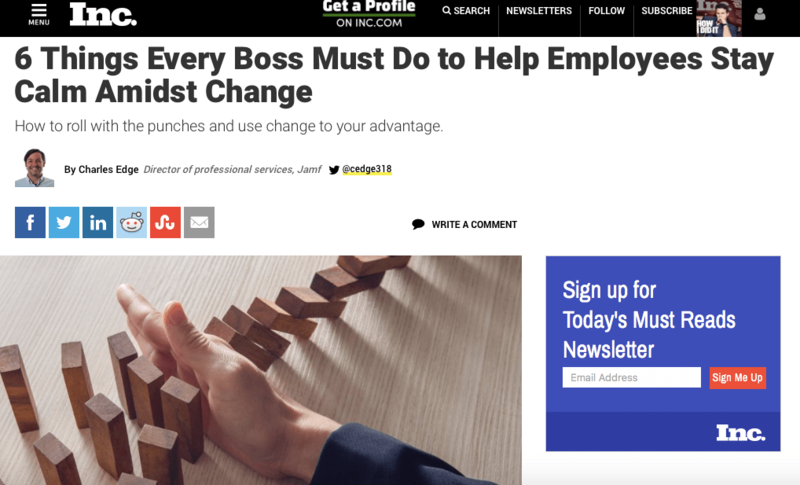 If this is the kind of thing you’re interested in, check it out at https://www.inc.com/charles-edge/how-to-collaborate-without-driving-the-rest-of-your-team-crazy.html. To read more, see http://www.huffingtonpost.com/entry/58c2eeeee4b0c3276fb7845c. 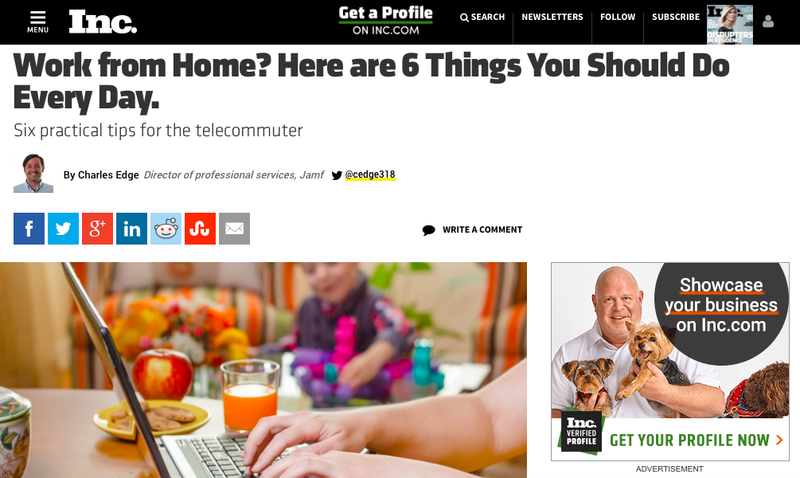 Telecommuting is on the rise. According to a 2015 Gallup poll, 37 percent of U.S. workers say they have telecommuted at one point or another– four times greater than in 1995. But working remotely can be a challenge. Not only can telecommuters feel disconnected from the organization, the organization can also feel disconnected from them. “The only thing that never changes is that everything changes,” author Louis L’Amour wrote. Nowhere is this truer than in business. 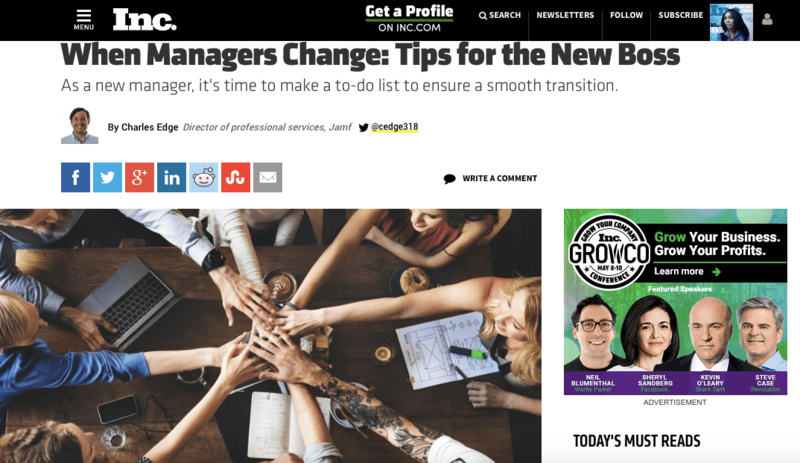 Managers leave, get promoted or are transferred to different jobs. As an incoming manager, you face a special challenge when taking the reins from someone who may have led the team for a long time. As the “new kids in town” you owe it to yourself, your new reports and the organization not to get caught flat-footed during the transition. 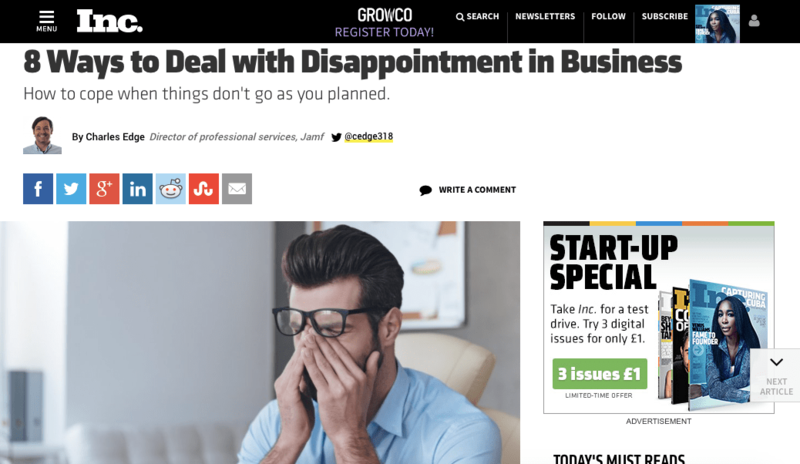 Disappointment is inevitable in business. Everything can’t go your way all the time. Maybe you didn’t close that one sale you wanted. Maybe your budget didn’t get the increase you wanted. Maybe you got passed over for that promotion. So how you deal with disappointment is as important a business skill as understanding finance or being a good leader. It keeps you steady when times get tough, it strengthens you to stay in the game for great opportunities in the future.